(Newburyport) The white caps were not on the players’ heads but on the Merrimack River in the background at Cashman Park Wednesday afternoon. 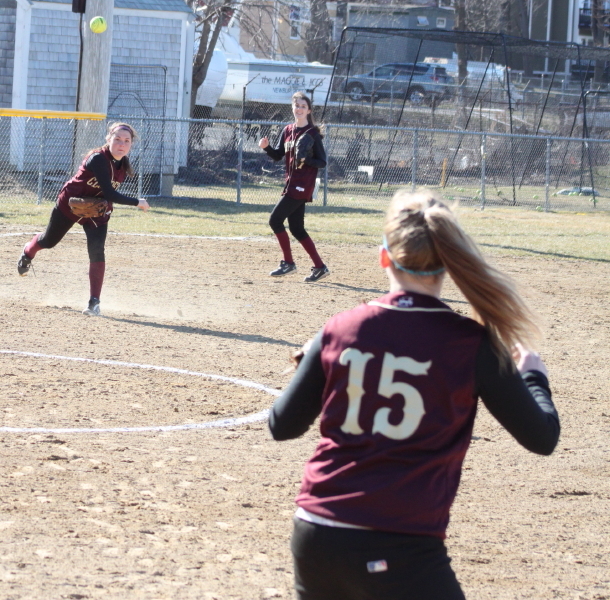 But I doubt the Newburyport Clippers softball team minded the cold, windy setting as they defeated North Andover, 3-1, in a non-league season opener for both squads. Senior Casey Barlow (three hits and three RBI) was the hitting star for NHS. Last time I saw Casey in action it was in basketball and the lefty was shooting free throws right-handed because of an injury. She’s fully recovered! Casey’s wind-effected, two-out blooper in front of North Andover third baseman Paige Alholm delivered a run for the Clippers in the first inning. 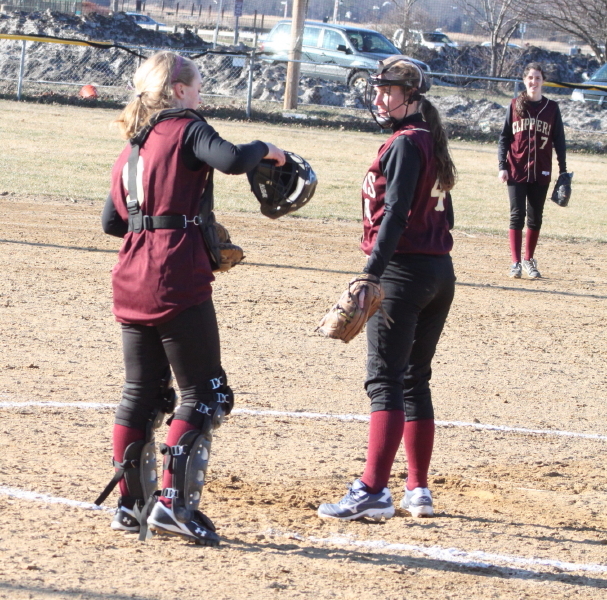 Later, in the fifth inning, Casey put a charge into a liner over right fielder Jess Bramanti’s head and circled the bases successfully despite slowing up rounding third. Kendra Dow scored on the play and Newburyport had the two runs that would make the difference in this game. The Knights got their lone run in the third. 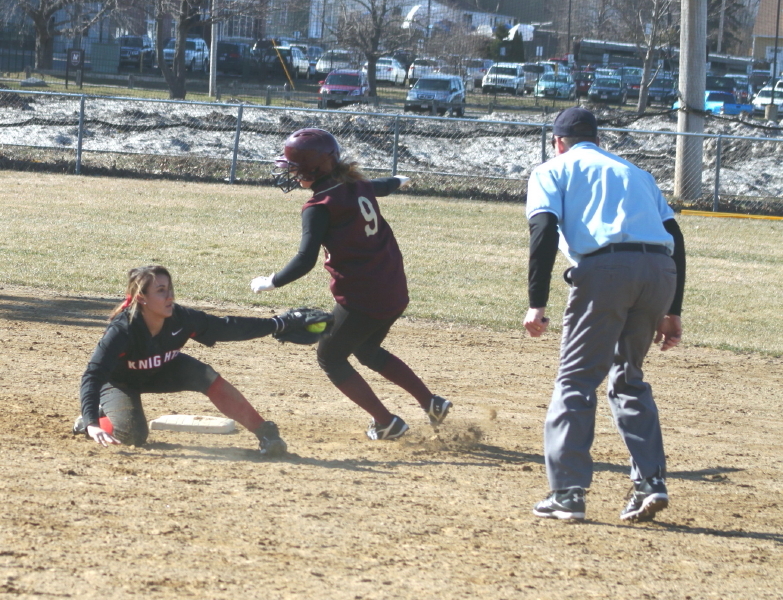 Kim Crucioli singled Dahlia DeCologero to third and the senior scored on catcher Lauren Bean’s passed ball. 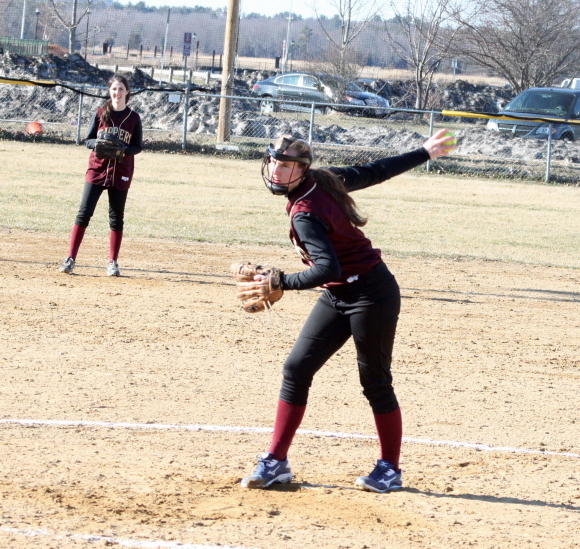 Victoria Allman had a strong outing for Newburyport. The junior gave up six hits but struck out ten. Victoria had five K’s in the first two innings. NA threatened in the fourth as Jess Bramanti and Paige Alholm both singled with no outs. 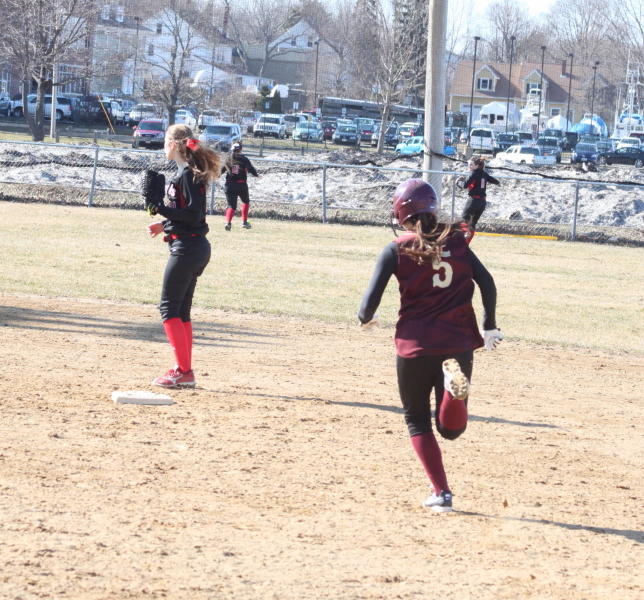 But Victoria served up a fly ball out to Lea Tomasz and two infield grounders handled by second baseman Jackie Krusemark to end the scoring chance. 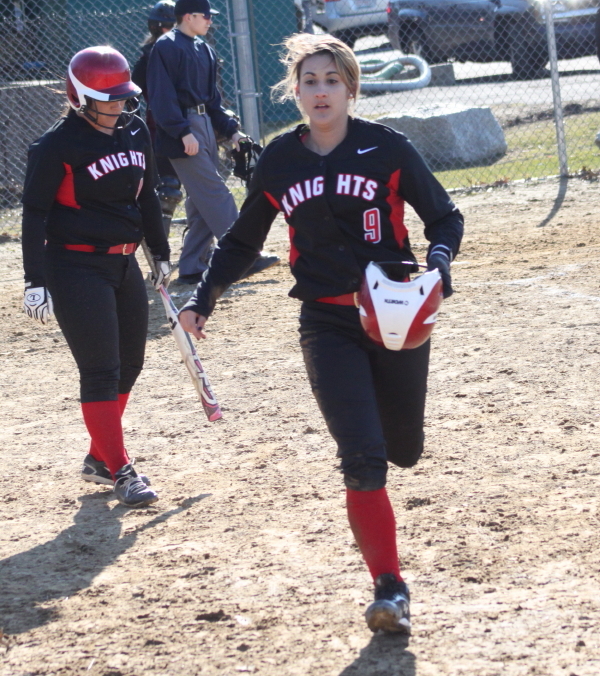 The Knights put together a more serious threat in the seventh inning down two runs. Danielle Wilson beat out an infield hit past the pitcher and later leadoff batter Dahlia DeCologero doubled over Ashley Hodge’s head in left. That put two runs in scoring position with two outs. But Victoria got Kim Crucioli to ground out to second to end the game. Dahlia DeCologero had two of NA’s six hits. 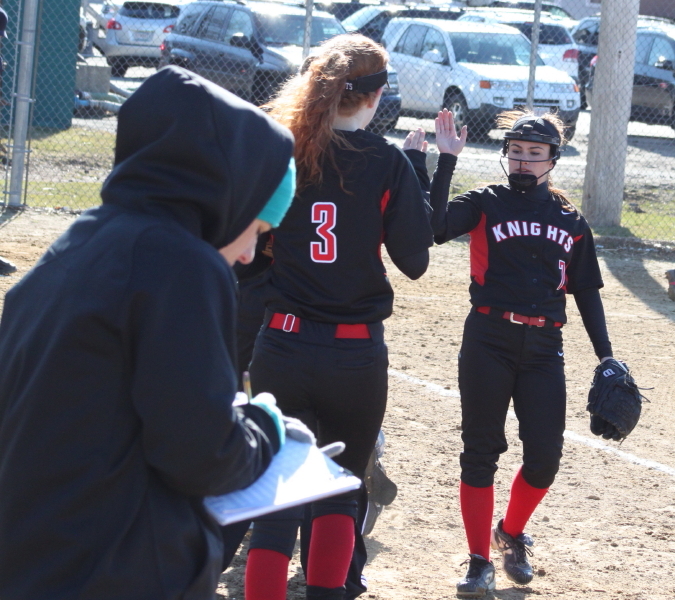 Knights’ pitcher Kim Crucioli (6 hits/4 K’s) came up big in the bottom of the second. Meghan Stanton belted a triple over the head of leftfielder Sarah Lemerise with no outs but Kim struck out two and induced a popup to escape. 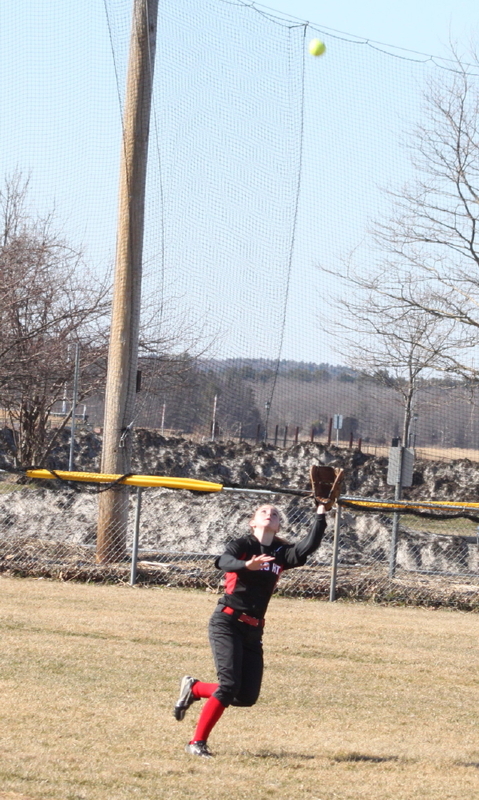 Shortstop Kendra Dow erased a Knights scoring attempt at the plate in the first inning. Dahlia DeCologero had reached third after singling, stealing second, and getting third on an errant throw by catcher Lauren Bean. Kendra was playing in and Courtney Green’s grounder reached her quickly and her strong throw to Lauren Bean was there in plenty of time. Another key to the Newburyport win? Keeping Courtney Green under wraps. Courtney was the Player-of-Year in Division 2 of the Cape Ann League last season. Victoria Allman held her hitless in three plate appearances. North Andover has moved to the Merrimack Valley Conference and they are certain to find the level of competition quite different than in the CAL with plenty of Division 1 teams on their schedule. I took in last year’s meeting between these two teams on May 11th. The Clippers won that one, 3-2, in eight innings. 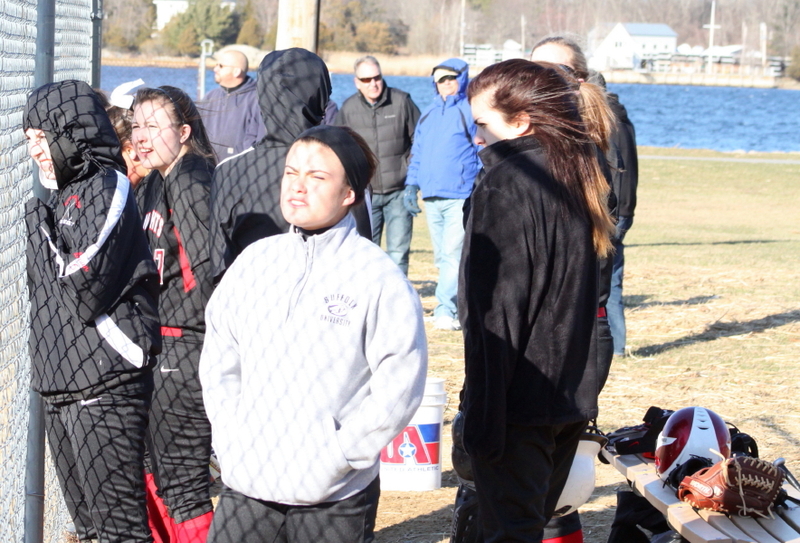 North Andover was 10-11 last season. They have a new coach – Caitlin Flanagan. 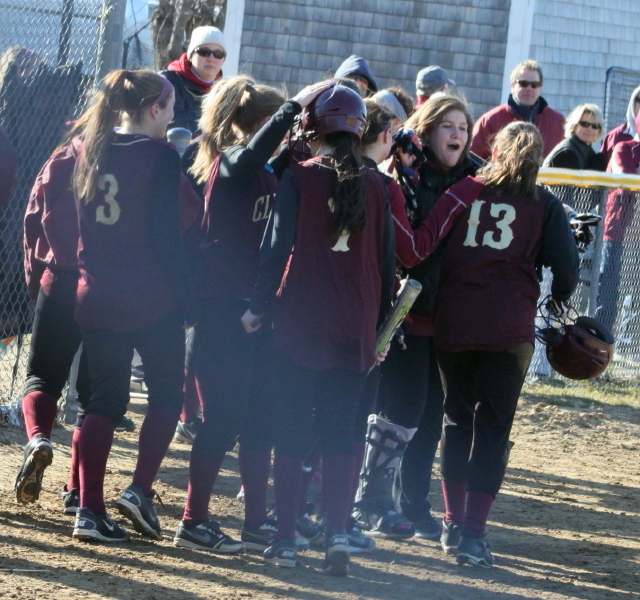 Newburyport was 13-10 in 2012 under Coach Lori Solazzo. Next for North Andover is a trip to Pentucket on Friday. Newburyport next plays on Monday at Saugus. Carley Siemasko and Kendra Dow were CAL All-Stars last season.